Very Good. Trade paperback (US). Glued binding. 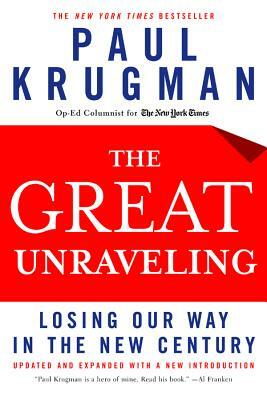 516 p. From irrational exuberance to corporate scandals, from the war in Iraq to the looting of California to the false pretenses used to sell an economic policy that benefits only a small elite, Krugman tells the uncomfortable truth like no one else. The paperback edition of this bestseller features a new Introduction as well as new writings. Good. Trade paperback (US). Glued binding. 516 p. From irrational exuberance to corporate scandals, from the war in Iraq to the looting of California to the false pretenses used to sell an economic policy that benefits only a small elite, Krugman tells the uncomfortable truth like no one else. The paperback edition of this bestseller features a new Introduction as well as new writings. Very Good. The national bestseller: A galvanizing work from America's leading economic critic-a book that will set the terms of the political debate for years to come. Sewn binding. Cloth over boards. With dust jacket. 426 p.
Good. The national bestseller: A galvanizing work from America's leading economic critic-a book that will set the terms of the political debate for years to come. Sewn binding. Cloth over boards. With dust jacket. 426 p.
Very Good. 2003. 1st Edition. Hardcover. Fine in fine dustjacket......We ship daily from our warehouse.